Sardonic satirical version of the novel The Big Town from F. Scott Fitzgerald friend and witty scribe Ring Lardner that was tailor made to play up the acerbic wit of radio humorist Henry Morgan in his feature film debut, So This Is New York is best appreciated for the cross-section of talent that collided in what is an otherwise experimentally uneven picture. The cinematic brainchild of ambitious newcomer producer (and future director) Stanley Kramer and soon-to-be-blacklisted future High Noon and Bridge on the River Kwai scripter Carl Foreman (who adapted Town alongside Herbert Baker), New York marked the feature-length debut of Richard Fleischer who was unafraid to employ adventurous techniques in his first time at the helm. Although the decision to serve up subtitled translations of New Yorker “dialect” for its Midwestern out-of-town characters was modern for the time, perhaps the most inventive contribution Fleischer made was as an early pioneer of extended freeze frames in what can arguably be considered a mainstream Avant-garde work. In addition to trying to find new opportunities to convey information and punctuate Morgan’s humor, the extended freeze frame technique offered his lead a chance to riff as a comedic narrator similar to the way that audiences had gotten used to hearing him over the air on the radio (before Morgan would subsequently embark on a career in television). 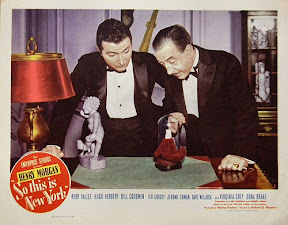 Though Fleischer took each approach merely to the tip of the iceberg, later more New York filmmakers like Woody Allen in Annie Hall and Martin Scorsese in Goodfellas would really break the ice and explore what both methods could do, turning them into an art-form to read a character’s internal thoughts in Hall and contrast visual and auditory information in Goodfellas. Overall as it stands, there’s not much to take away from the rather episodic narrative structure of the film designed to appeal to the same viewers who appreciated the sweet and sour flavor on display in Preston Sturges’s sophisticated comedies. And while the energetic cast tries their hardest, the sitcom-like feel of a pre-sitcom era script is ultimately to blame. New York tells a comedic fish-out-of-water tale about Midwesterners who venture to the Big Apple only to discover that the grass is greener back home in Indiana where life moved at a slower speed and everybody wasn’t out to hustle them for a quick buck from horse-race fixers to a comedian looking for a foolish investor to back his dramatic Broadway debut. 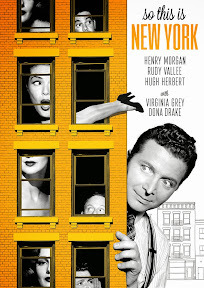 Hoping to keep an eye on his scheming wife (Virginia Grey), Morgan travels along as a chaperone when, following their inheritance from a recently deceased relative, his wife decides they’re going to head to the hustle and bustle of the big city in order to find a rich cultured husband for her newly rich, beautiful younger sister (Donna Drake). Unwilling to let her sister marry the loyal but unexciting Indiana beau pining away for her back home, the women soldier on as Morgan schemes on his own, trying to keep them from losing every cent until predictably they do just that. Repetitive and formulaic, each new incident in New York is strung together like a different short story rather than a new chapter from the same book. And while it’s entertaining enough for a lazy afternoon, despite its auspicious and technically creative merits it’s best remembered more as an early stepping stone taken by the cast and crew to get to the next phase of their career (which is par for the course of the theme of this grass-is-always-greener comedy).